Aussies love their lawns, but sometimes they become patchy and sometimes they become quite thin as well. Your main problem is identifying the cause of the problem and once you have done this, the solution is often very simple. So, let’s look at some of the common causes of patchy or thinning grass and how to can fix these problems at home. Clearly these bare patches are due to the soil being compressed by too much foot or vehicle traffic and tend to occur in popular walkways across the grass or when cars are parked on the lawn. They can also be seen along the edges of decks, patios and paths, as well as around the clothesline and particularly where the postie rides to your post box. You can of course, fix these patches with lawn seed, after aerating to reduce the compression of the soil, but if you don’t reduce the traffic in these spots, you will have to keep doing this on a regular basis. The long-term solution is to add some stylish stepping stones or a real concrete or gravel path to the areas that are patchy due to high pedestrian traffic and a driveway or new parking slab for cars. Along the fence lines these bare patches can be due to your dog racing around like a banshee and barking at everyone who goes past! They can however, be due to a lack of direct sunlight caused by overhanging plants or because sunlight is obstructed by tall fences. A lack of light can also cause the grass to thin in these same areas, so you might have a combination of patchy and thinning grass. The solution depends on the cause of the problem, so you might have to stop your dog using the fence line as a racing track and trim any overhead branches that restrict sunlight. Changing the height of the fence is usually not an option, so adding shade loving plants to your garden beds might be the best solution. Generally, there are two causes for random patchy areas in your lawn. It’s either dog urine or lawn grubs. If you don’t have a dog then it’s likely to be lawn grubs! 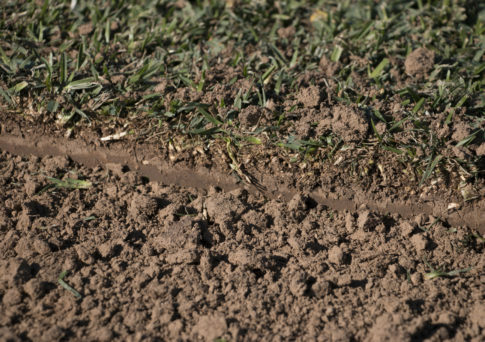 You know that you have lawn grubs if you have brown patches in a lovely healthy lawn and you can easily lift the grass because it no longer has any roots (they were eaten by the grubs), but you should also easily see the grubs about an inch or so under the top of the soil. If you can’t see any lawn grubs and you have a dog, then that’s likely your culprit. If the cause is grubs, your local nursery will sell you something that will get rid of them and if it’s dog urine, hose the area down as soon as you spot the problem and following every urine event. Long term, you might have to keep your dogs away from the lawns if the patches are too much of a problem, but lawn seed will help in the short term. If you have noticed that your grass is growing a lot thinner than normal, then it might be due to too much shade. Too many large trees and bushes can easily shade a small lawn, causing the grass to grow too thinly, but it can also be caused by a lack of sufficient water and a lack of fertilizer. The real solution for thinning grass is to either lop branches if they are the problem or to aerate your lawns, water them regularly and add a good fertilizer to increase healthy growth. You can also add some new lawn seed, which with the additional watering and fertilizer, should soon give you a lush lawn once again. For information on our turf, installation and delivery, call us on 1300 781 175 or shoot us an email.